Last night was an eventful night here in our slum. Police helicopters were flying all around, in search of people. This began around 3 am and continued on and off all morning long until about lunch time. I figured that the police must have been searching for some drug traffickers. They often use helicopters to search for people and patrol because it is easier to spot people in the narrow and windy streets of the slum. A bus was being burned. No one was inside the bus, but it was set on fire by people from the slum. They did this as a demonstration to show their frustration and anger towards the police. It seems that two innocent people were killed by the police (one being a minor). I must admit... When I think about all these things happening in the community where we live, it puts a certain level of fear in my heart. I know that "things" go on here, but to really see it and to be reminded of the reality of life here, well, this can be overwhelming at times. Especially since now it is not just us. We have Sophia to think about and to protect. "The safest place you can be in the world, is in the will of God." This is so true! It is His will that we are here in Brazil, living and working in a slum. He has called us here to work with children at risk, to be a blessing and to bring His message of healing and hope. There is much need of this here in the slum of Cafezal. People need to hear the message of His great love! 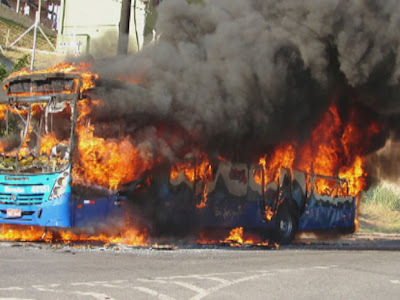 A bus (from line 4107) was torched on Saturday (Feb. 19), in the Serra district, South-Central Region of Belo Horizonte. According to the Military Police (MP), the vehicle was destroyed by fire after two residents were killed in an exchange of gunfire with police overnight. No one was injured in the incident with the bus, according to the MP. In an exchange of fire, two men were killed (one being a minor). One officer was also reported as injured. A resident of the neighborhood, who prefers to remain anonymous, claims that police killed two innocent people. "They were not criminals. They were workers," said the resident. According to him, the police, instead of protecting the people of the Serra neighborhood, do the opposite. "They [the police] are terrorizing the community. They act brutally. They come and put their guns to the heads of the residents, without asking for identification." He also said that in the early hours of Saturday (19th), with the death of two men, the population was scared. "People were running all night in fear. Nobody could sleep. We heard gunfire and helicopters all the time. " He added: "The atmosphere is one of revolt and fear because the police are not doing their jobs."